I've been thru all the vacuum diagrams that have been posted and I can't find the answer I'm looking for. Hard to find one for a California emission car with Ram Air. From the factory, where did the Ram Air get its vacuum source? I have verified on an earlier post that I have the correct factory intake manifold vacuum fitting. I can see that the two 1/4" ports supply vacuum via the plastic piece to the transmission and to the vacuum canister. In the picture from my car, the larger hose is, of course, to the P.B. booster. The two 1/4" ports have been spoken for. So, I still have two items with small hoses that need homes, but there's only one small port left on the manifold vacuum fitting. The vacuum line to underside of air cleaner and the vacuum line to the Ram Air are both 5/32" lines needing to go on 3/16" ports. Was there maybe something else on the stock 2V manifold I am unaware of? What was the vacuum source for the hose under the air cleaner and the source for the Ram Air? Where did the connections take place? I am just curious. Obviously I can put in a "T" but I'm curious how this was done from the factory. 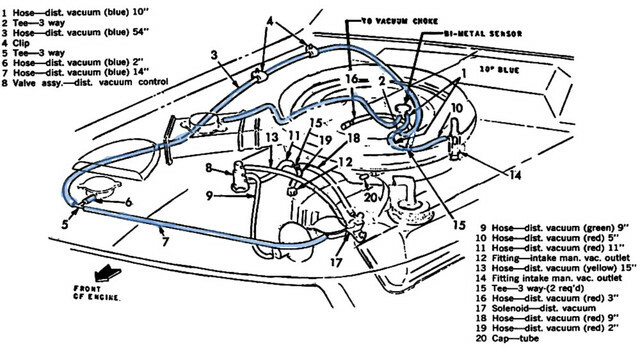 Every diagram I've seen for the Ram air has it tee'd off the line to the bi-metal sensor on the air cleaner base. I have one of the Ford / Osborne chassis manuals. I think there is an illustration for each one in that. I will look when in the garage. T'd off the line to the underside of air cleaner! I had not found/seen the schematic Rackerm posted. Explains that it didn't have its own dedicated connection point.